Amputee shows off 'Iron Man arm' Jump to media player Amputee James Young has worked with prosthetics designers to create a unique limb that looks like something straight out of a science fiction movie. The art of prosthetics Jump to media player Dr Saleyha Ahsan finds out how one artist is creating cutting edge prosthetic limbs. Inside a facial prosthetics workshop Jump to media player Behind-the-scenes of a 3D facial prosthetics workshop. When James Young lost an arm and a part of a leg in an accident on his morning commute, he thought his love of playing video games was over. 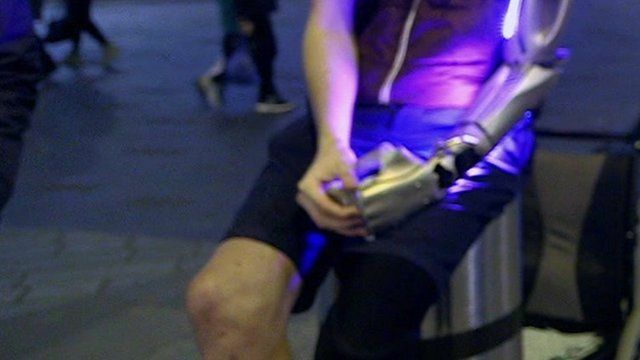 But after spotting an advert he began to work with prosthetics designers to create a unique limb that looks like something straight out of a science fiction movie.